I kept waiting for my turn, though I was hesitant, and scared about it. My eyes never bothered to look anywhere else; passing through everyone’s arms, that little thing reached back, into my wife’s arms. She looked at me, with saintly and love-filled eyes, and called me near her, in a weak tone, but I was nervous, and she noticed it. I slowly walked towards her, and she smiled, she made me sit beside her, and slowly tilted her head, on my shoulder, and smiled. She saw first at that little thing, and then, towards me. I knew she wanted me, to take it in my arms, but my hands trembled severely, I feared I might hurt it, though, I knew how ecstatic, I was within; she looked at me again, and I wagged my head left and right, due to fear. she glared at me and again I lose ! I slowly stretched my hands, a little, towards that little thing, but my hands trembled. Sweat dripped down my face, and I took my hands back again, and she chuckled, seeing me, while, I looked at her, with helplessness, but, her angelic eyes kept giving me the courage to do it. She was always my strength, and never a weakness . I slowly gathered some strength, and again, moved my hands towards that little thing, and slowly, but carefully, I took it in my arms, and she helped me, with it. She kept looking at my reactions, and I knew, my reaction, was like, that of a surprised, and wondering, three year old. I kept looking at that little wonder in my hands, it had its eyes closed, and looked really tired. I keenly looked at its facial features, with wonder. 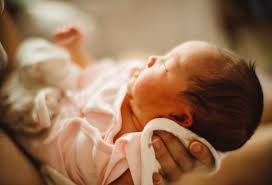 I carefully cuddled it, more, into my arms, to comfort it, and a smile appeared over the little face, along with a weird noises, and some tiny movements, but it did cheer me up and a smile managed to form over my face. Anika leaned onto my shoulder, and encircled her arms around me, and kept looking at us, with those tired eyes, and I kissed on the top of her head, for gifting me this precious little thing, on my birthday. I wrapped an arm around her, while my other hand kept that little thing safe, in my embrace. from her mouth, making painful expressions and she chuckled, seeing my expressions, and pulled my cheek so hard, that they had to become red. “PRABDHI–, cause she is unique–! ” I said, with a smile, and she nodded, her head, and my daughter, who was crying, till now, paused for a while, as she heard that, and smiled, and when we smiled seeing her, she started wailing again. “Just like your mother”I said and we kissed her little forehead together and she chuckled again. Our blood, our love, our baby, was finally born. Hey Luthfa My KC , so here is your OS for Shivika from my side ….finally punishment is over and now you can tell me for what I got this punishment hehehe. sorry i love names from P more so i use one of the favorite name i know you guys might hoping Shivika. HAPPY VALENTINES DAY ALL OF YOU DARLINGS ! !